The new missile system will be installed aboard the Indian Navy’s latest classes of surface warships. The Indian Navy took delivery of the first domestically assembled long-range surface-to-air missile system (LRSAM) on August 27 in Hyderabad, India. The LRSAM was officially handed over to Indian Defense Minister Arun Jaitley in a ceremony attended by Israel Aerospace Industries (IAI) and Indian business officials, as well as senior representatives from the Indian Navy and Ministry of Defense (MoD). 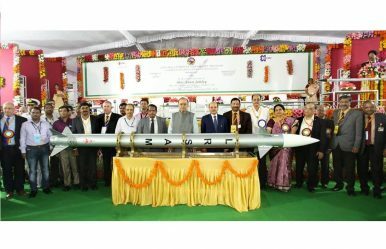 It is the first LRSAM off a production line set up in India by Israeli defense contractors IAI and its subsidiary Rafael, as well as Indian missile maker Baharat Dynamic with support by the Indian MoD’ Defense Research and Development Organization (DRDOs). LRSAM was jointly developed by IAI and India’s state-owned DRDO in partnership with defense contractors in both India and Israel as part of Indian Prime Minister Narendra Modi’s “Make in India” initiative. “The local production line is provided with Israeli-made assembles which are integrated with Indian-made assemblies into an operational missile,” the IAI press release notes. LRSAM will get deployed aboard the INS Vikrant, India’s first indigenously built aircraft carrier, Visakhapatnam-class guided missile destroyers, Kolkata-class destroyers, Kamorta-class anti-submarine warfare corvettes, and the still to be constructed future Project 17A class of stealth frigates. So far, LRSAMs have been installed aboard three Kolkata-class vessels. An earlier variant of LRSAM, the Barak-1 supersonic, vertically-launched short range air defense system, is currently in service with both the Indian and Israeli navies. Furthermore, I explained: “[T]he LRSAM was test launched from INS Kolkata, the lead ship of the Project 15A Kolkata-class, in December 2015 in the Arabian Sea and successfully destroyed aerial targets at extended ranges, the Indian Navy announced at the time.” In April, India’s MoD has signed a $2 billion deal with IAI for an advanced medium-range surface-to-air (MRSAM) missile system, a land-based variant of the LRSAM. The April deal includes one regiment of 16 launchers and 560 missiles for the Indian Army. Overall, the Indian Army intends to stand up five MRSAM regiments in the coming years.